So - I am on my way out the door and had less than 10 minutes to spare when I remembered, I didn't get a chance to put together for todays post. I just received some new "rubbah" - I received my second set of new Clear mounts from Stampin Up!- so what better way to try the out! I grabbed the CD case of Vintage Vogue, some markers that were on the desk, along with CS that was sitting there already scored and probly for a project I was about to start..
Vintage Vogue in Rich Razzleberry on Sage..
not bad for a lunch time card -huhh? Yes, the Hello comes from the Hello Again set, that I found in the car, on the floor. Must have dropped out of the bag from yesterday, since I had hoped I would get a card started while I was away (note that didn't happen). 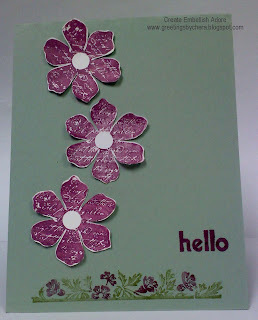 Ingredient: Vintage Vogue & Hello Again, stamps; Rich Razzleberry & Moss green Marker;Sage & whisper white CS. And most of all, HAPPY MARCH!!! Lovely card. I'm so happy that I can order that set,as from today, as well as Rich Razzleberry! Thanks for the inspiration. Mmm... razzleberry! Sweet card, and great take on the challenge. Thanks for playing at Just Add Ink! Hey cool beans, it's my birthday too, Happy Birthday to us, Happy Birthday to us,,,,kidding, a very happy Birthday to you, enjoy the CAKE! I really like the colours you've used - lovely card! So sweet! Love that set. Thanks for playing at Just Add Ink!